The Idea: Getting curious about three or four things during the next handful of months will lead you to your next purpose project or even help you re-frame and re-energize your current purpose project. Why This Matters: I propose two things: 1)we find purpose in the place where our love overlaps with the needs of this world; and, 2) that it is impossible to really love something unless you are deeply and endlessly curious about it. Since curiosity is a vital ingredient to love, it is important that you practice curiosity - unless you're OK with losing love in your life. The Idea in Action: Below I share the "results" of my recent dive into getting curious. The first curiosity showed me how to be healthier and more effective in life. The second helped me understand my heart a little better. The third has helped me better understand you, especially those of you who serve a charitable non-profit. Like in years past, I was fortunate to be a presenter once again at last month's annual Down Syndrome Affiliates in Action Leadership Conference. Since I returned I have been honored by the number of people who shared their thoughts with me on one session I offered called "You're Not Leading, You're Stealing: It's Time to Lead". This idea comes from that session. What role does faith play in you discovering and living your purpose? With the exception of a couple peripheral references to that question here, here and here, this is not an idea we have explored much. But, it is worth taking a look at. In October of last year I had the good fortune to meet Kermit Hovey, Director of Operations and Development at Care of Creation (CofC), a faith-based environmental action organization and ministry. CofC is just one example of the numerous ways people combined the “purposefulness” of non-profit work with faith. Below I share with you the heart of Mr. Hovey’s correspondence with me about his faith how that inspires his purposeful living. P.S. - I am sharing these ideas just a handful of days before Care of Creation holds its Tenth Anniversary Celebration. You are invited to the party! Festivities begin at 6:30 pm April 18, 2015 at Christ Presbyterian Church, 944 E. Gorham St, Madison, WI. The gathering time will offer conversation, light refreshments and desserts. The formal program begins at 7:30 with a scheduled keynote from Cal DeWitt, UW Madison Professor Emeritus of the Nelson Institute and father of modern Evangelical Environmentalism. For details and to RSVP please go here. I hope to see you there. I love the Great Courses by the Teaching Company. If you are not familiar with this company they produce a series of college-level audio and video courses in partnership with highly recognizable professors and experts. This idea comes from their course entitled Art of Conflict Management: Achieving Solutions for Life, Work and Beyond by Professor Michael Dues at University of Arizona. You may have noticed that this website has a new look. If you haven't had the chance to check it out I would really love to hear what you think. Please go here and then shoot me an email at sterlinglynk@att.net with your thoughts or just share a comment below. But a prettier website is not why I'm writing you today. I am writing because I never thought that giving this site a makeover would be so personally meaningful and hopefully useful to you. The Thing You Lead Must Be Perfect. Here's An Opportunity To Make That Happen. OK, of course no organization is perfect but having clarity, aligning your mission and values to your operations, and making a measurable impact gets us pretty darn close. If you cannot use the terms "vision", "clarity", "impact", and "aligned" then I have the opportunity for you. This year the crew behind Madison Non-Profit Day have done me the great honor of inviting me to present during one of their extended pre-conference sessions. I will share with you And, there are still some tickets available. The pre-conference sessions happen on October 1st and the conference itself happens all day on October 2nd. Your ticket gives you access to both, but I recommend that you pre-register to make sure you get into my session. This year there is even an opportunity to schedule a one-on-one mentoring session with an expert in your specific area of need. This is a brilliant way grow your leadership capacity, especially if you close to Madison, WI or you can get here. You can learn more about Madison Non-Profit Day and even register for the conference here. Alternatively, you can see a description of all of the pre-conference sessions, and you can sign-up directly for both the conference and the pre-conference sessions by going here. P.S. - If enough of you MightyPurposers come out for this, maybe we can schedule a special dinner for members of this community. Let me know if you can make it. I can be reached at sterlinglynk@att.net. I was digging around looking for ideas to share at the up and coming Madison Nonprofit Day and I found this presentation I shared a couple years back at the DSAIA Leadership Conference. If you serve on a board or work with a board you should check this out. Not only are the people around vulnerable to acting in ways that are unhealthy for your organization but you are too. Hopefully this old presentation will give you some tools to do something about it. P.S. - The contact on the past page was accurate...two years ago. The best way to reach me now is at sterlinglynk@att.net or at (608)698-6055. I am here to help. Once upon a time, in a land far away, in a time long ago, there was a man. The thing he loved was doomed and he knew it. That meant he was chosen to do something about it. If a saint takes on the downside so others can have the upside, this man was fairly saint-like, taking much of the downside that comes with being an unapologetic prophet, with a terrible, non-stop travel schedule and a willingness to put himself out there for what he believed. It shouldn't surprise you that this man made a lot of enemies. In fact most of his enemies only really agreed on one thing - how much they disliked this guy. When those enemies made their move the man's friends and followers abandoned him. Worst of all, he didn't end up saving the thing he loved. In the end the man died a brutal, public death all alone. The thing you love is doomed, especially if you love an organization. I know that many of you know this already. This community has been talking to each other. You've been calling me. And, you've been clear about how doomed you are. I had one of these conversations today. Near the end of the conversation the potential leader I was speaking with said, "I agree with you that we need to act intentionally and aggressively, and approach our situation with focus and energy, I don't think the other members of the board will get into this. Maybe the Executive Director will agree, but who is going make sure this is going to happen? Who is going to leads us?" Last year I shared with this community something I called The Perfect Life Test. This test was simply the 4 most important questions you should ask yourself and then act on your current best answers. My inspiration for these questions was my preparation for a session called the "The Perfect Non-Profit" I offered at the 2013 DSAIA Leadership Conference. In 2014 I was allowed to do it again. I did some rethinking and reworking of the experience that I hoped made our time together more worthwhile for the participants. 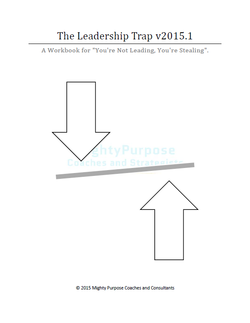 I offer you the updated workbook. I know many of you are involved with organizations with social missions and this tool may help bring you some new focus. There are 6 core questions, 3 supporting questions, and 1 bonus question. Please feel free to use it and share it.